"AZA from Selangor, aged 40 was diagnosed with stage 2 Breast Cancer, with the recommendation of a friend to try alternative medicine from Phytomedicare, CELLCARE and SUBACARE, after 4 years the Doctor claimed she was free from cancer." "IRMA D. ROZA from Shah Alam, aged 51 was diagnosed with stage 3(A) Breast Cancer, going thru Mastectomy, Chemotherapy, and Radiotherapy alongside with strict diet and CELLCARE and SUBACARE, she is now free from cancer." 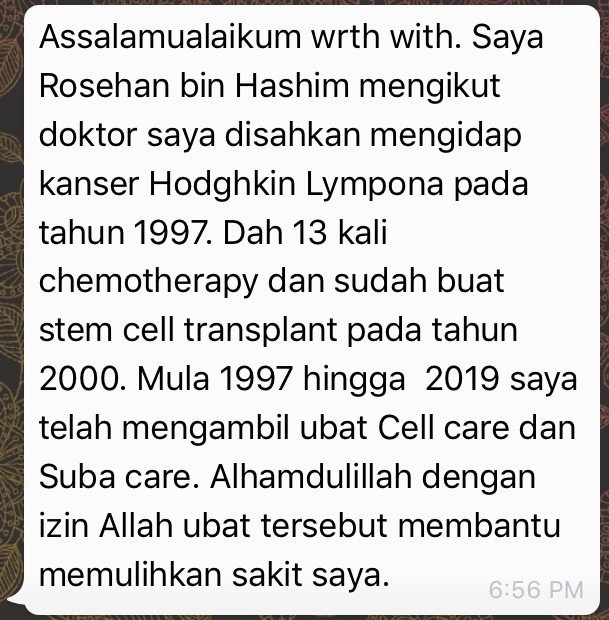 "Rosehan B. Hashim was diagnosed with Hodgkins Lymphoma back in 1997, 13 times of Chemotherapy and Stem Cell transplant in 2000, alongside with CELLCARE and SUBACARE Alhamdulillah the medicine helps to overcome his sickness." "En. Mat from Kuala Lumpur was diagnosed with colon cancer at the end of 2017. Doctors advise to remove part of the colon that infected with the cancer cell. He was told about Phytomedicare and decided to try, CELLCARE and SUBACARE, and postpone the surgery. He is on the alternative medicine for one year and half now and other symptoms of pain in the stomach and bleeding during defecation has also had stopped."